I’m either cursed or fortunate that my boys love seafood. 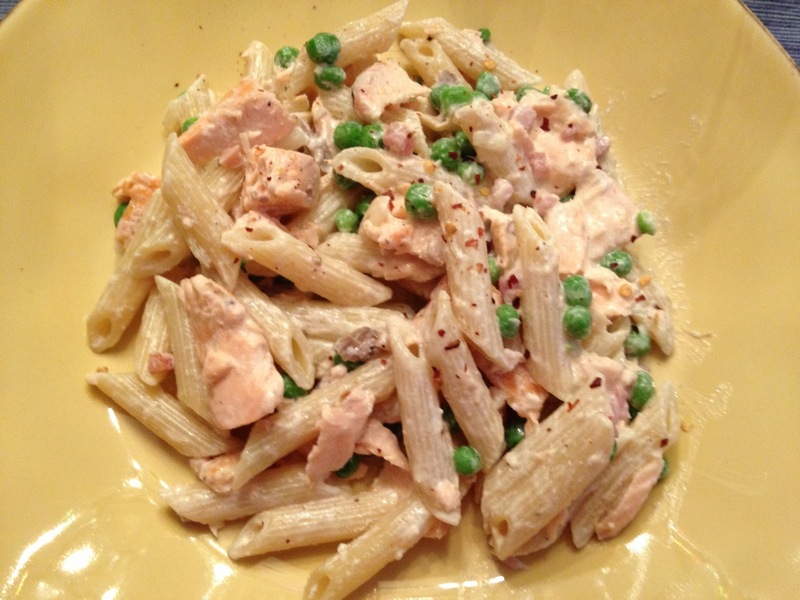 For certain, they love pasta, so whenever I get the chance to mix the two, all the better. 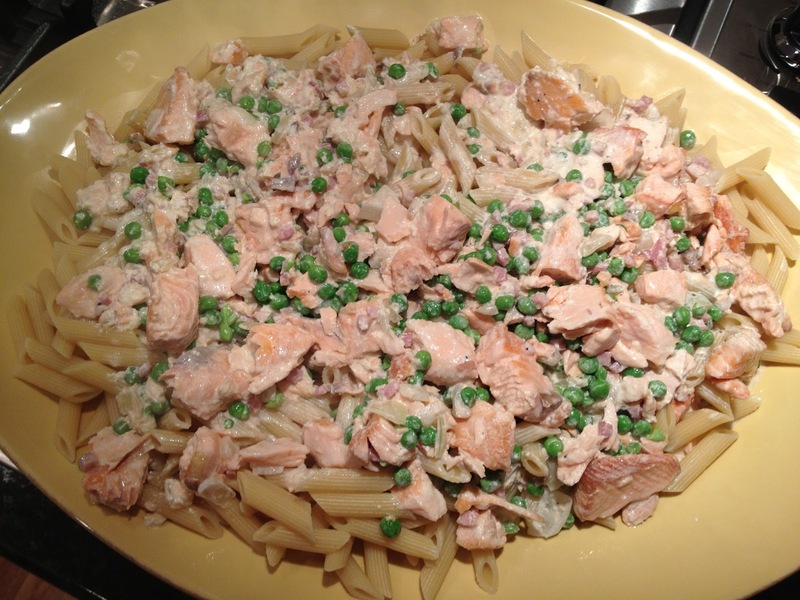 This dish is very easy, yet it appears elegant and difficult. It was very satisfying on a cold, gray, snowy March day. In a large skillet, the first step is to sear the fish. It doesn’t have to be cooked completely through, just most of the way. The important part is to leave it alone while it sears. The crunch to the texture is amazing when it’s done properly. Be patient, and make sure the fish is dry before you start or else it will steam. When the fish is done, set is aside so that it will be cool enough to handle. Wipe out the saute pan, add some extra virgin oil – a few table spoons is fine, and saute the onions and pancetta until translucent. While this is going on, get the pasta water boiling. Remove the Mascarpone to a large bowl and whisk in a few splashes of milk with the cheese, just so that it forms a cheesey sauce like consistency. I didn’t measure it, but I’ll guess that I used no more than 1/4 cup of milk. Once the cheese hits the saute pan, it’ll melt if there’s still some clumps. Whisking just speeds up the process. 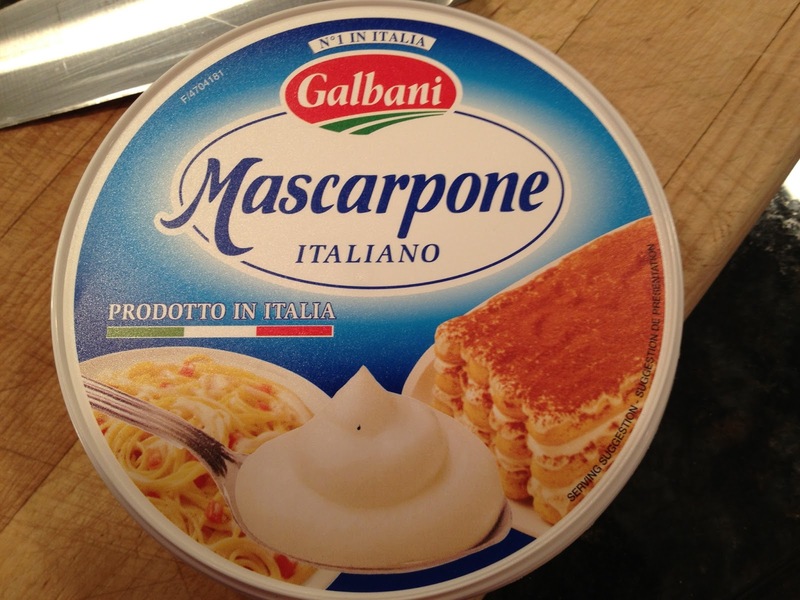 Here’s the Mascarpone I used. It was delicious. I can just hear Giada DeLaurentis Pronouncing This. My friend Bill loves when she does that! 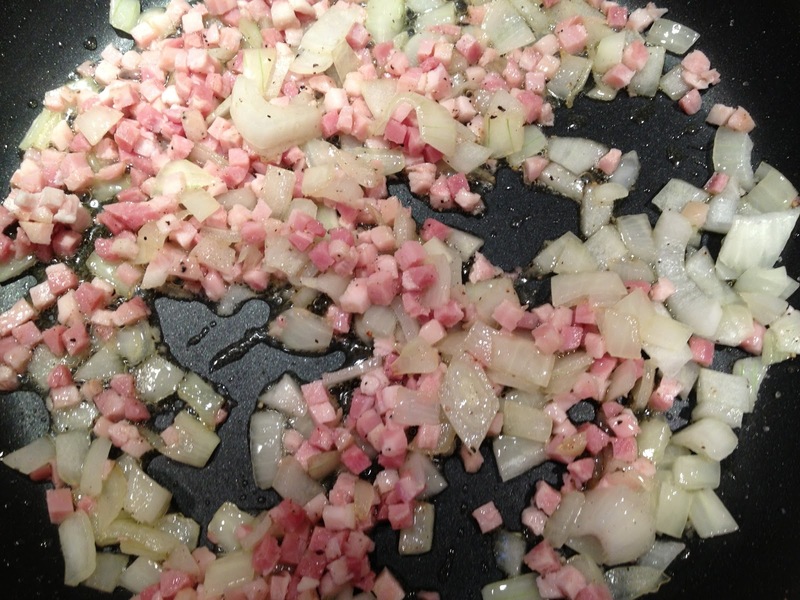 Once the onions and pancetta have sweated enough, add the cheese/milk to the pan and season with salt and pepper. For as nice as Mascarpone can be, it is a bit bland, so you need to taste and adjust as you go. 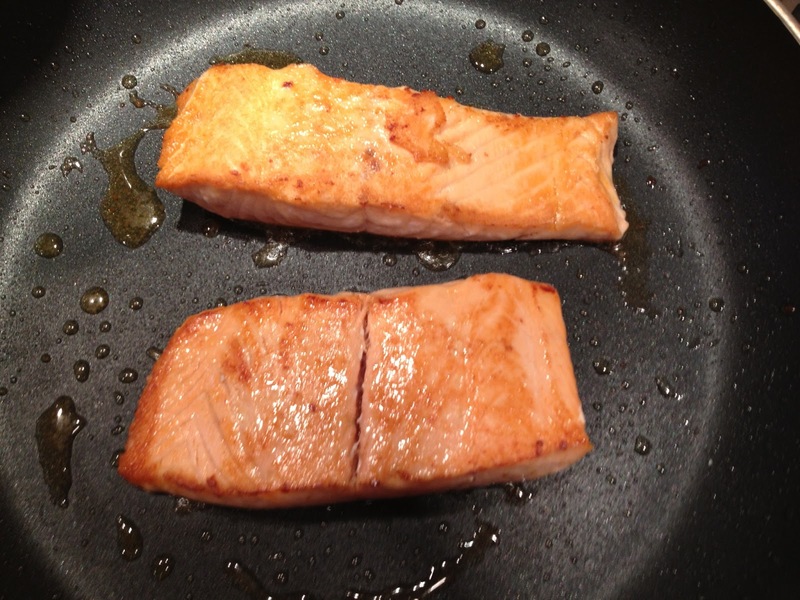 Remove the fish from the pan and transfer to a cutting board. Randomly break the fish up with a knife. Don’t murder it! As you toss the pasta later, it’ll break even more and cling to the pasta. 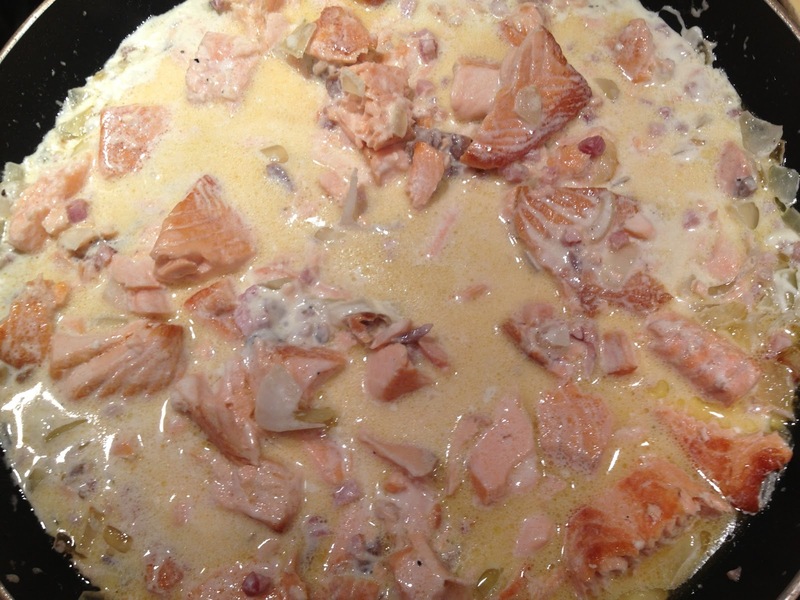 Just break it up gently into chunks so that it finishes cooking in just a few minutes. Just before the pasta is done, add the frozen peas to the saute pan and stir through. The color they provide really brightens the dish and they cook almost instantly. Finally, drain your pasta and plate. I used a large serving platter since their were six of us – warm it ahead of time if possible because the fish will get cold rapidly. If the sauce seems “tight” you can always add a little splash of milk or even some extra virgin olive oil. This is so delicious!